Yamaha's console piano series continues to evolve with the YDP-S52, an upright-style home piano with the sound and style you've come to expect from Yamaha. It is available in a rich black finish or in a stunning white finish. Depending on the decor of the room you intend to put it in, the perfect complement can be found in the YDP-S52. Select black or white from the dropdown menu. It is attractive and surprisingly compact for a full-size piano. Check the specifications table and break out the tape measure to make sure it fits where you'd like it to go. You might be surprised at the "yes" answer the tale of the tape gives you. 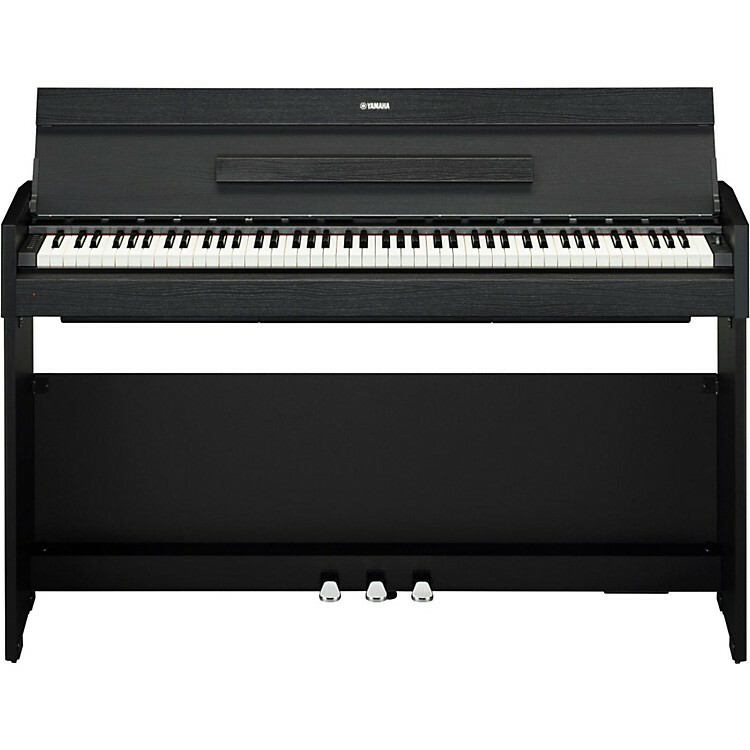 The main reason for most people to get a home piano is to have great live piano sound, and the YDP-S52 delivers a thrilling piano timbre with a tremendous range of dynamic expression, as well as a wide complement of other sounds including electric piano, strings, brass, choir and more. The YDP-S52 is equipped with Yamaha's highly regarded PureCF sound engine. This piano sound was recorded from Yamaha's renowned CFIIIS concert grand piano, heard on stages all over the world. It also offers an authentic performance experience, allowing for rich, natural reverberation even on complex passages with flurries of notes and extensive use of the pedal. The YDP-S52 lets you to enjoy relaxed, stress-free playing whether you're practicing at home or playing during lessons. Another critical attribute of a home piano is its playing action. Yamaha has been a manufacturer of acoustic pianos for many decades, and great piano action is part of Yamaha's DNA. Not only does the Yamaha YDP-S52 have the graded hammer action that made Tamaha famous, it additionally enhances its authentic grand piano touch with the feel of a synthetic ivory keyboard, whose keys absorb moisture from your fingers while you play in order to prevent slipping and to keep you comfortable. Whether you are playing in an acoustically treated room or a small and non-revererant space, you can design an audio environment that makes the most of the YDP-S52's PureCF enging sound. These professional quality effects reproduce the natural reverberation heard in concert halls and other performance venues. Enjoy the ambience of concert hall recitals, live gigs in jazz clubs and more, all in the comfort of your own home. The Recital Hall setting provides clear reverberation as heard in a medium-size hall used for piano recitals. The Concert Hall setting features a bright and gorgeous reverb sound, as heard in a large concert hall for orchestral performances. The Chamber setting is suitable for playing chamber music, with the intimate reverb sound of a spacious room as experienced during classical music recitals. Lastly, the Club setting emulates the vivid reverb sound in a live music venue or jazz club. Order today. This may be the one.